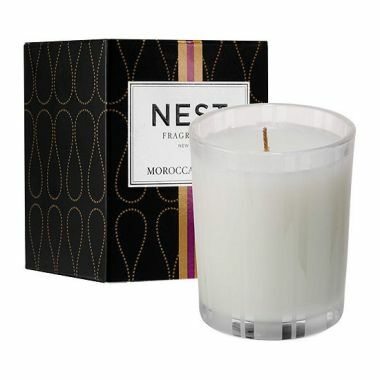 NEST is a brand that is pretty hard to resist if you love luxury candles. Every candle I’ve tried so far, I’ve loved. 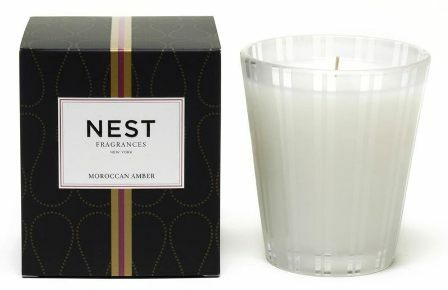 NEST candles are pricey as with any luxury candle but when you have the ability to treat yourself once in a while… trust me, they are worth every penny. Mmmm!! That’s quite the mix of fragrances in one candle. Exotic spices, floral, fresh and mint? It almost sounds too much but if anyone can pull it off, it will be NEST. – – – Smelling the wax, my nose detected bergamot and heliotrope with a hint of eucalyptus. Would the amber and patchouli make its presence known once the candle was burning? Oh, I hope so! I love sultry amber in any setting and patchouli can add a lot of dimension as well. I decided to be daring and light this candle in my large master bedroom to start out and within one hour ended up moving it to a much smaller room. The sole problem… this candle never reached a full melt pool and that I’m sure effected the strength. Once moved to a smaller room, the strength was much better. My entire guest bedroom smelled like a perfect blend of floral, bergamot and eucalyptus. I think I could smell hints of patchouli as well but it was pretty subtle. Amber? That I’m afraid was lost to me and I couldn’t smell any amber at all. Strength – I would rate Moroccan Amber an 8 out of 10 in a medium size room and that’s with the candle not even burning at its full potential. I imagine it would be a 10/10 in any size room had it achieved a full melt pool. How did my Moroccan Amber candle burn? This candle struggled from the get-go and never did reach a full melt pool, so it did tunnel leaving behind a lot of wax along the glass wall. Defective wick? Maybe. I will say this is not normal with this brand and makes me sad it happened. Luxury candles are expensive and should burn perfectly each and every time. Moroccan Amber turned out to be a very interesting fragrance that both surprised and disappointed me. I went in expecting a complex and sort of sultry amber and ended up with a fresh sort of foral/mint aroma that had a masculine vibe to it. Would I have liked more amber and patchouli in the mix? Yes, for sure – but I still enjoyed the scent for what it was… I just wish the candle itself would have performed correctly. Have you tried Moroccan Amber? Let us know what you thought of it in the comment section below. Visit Candles Off Main… our favorite one stop shop for luxury candles.